Every year there is a Christmas Fayre, usually held on the last Sunday in November in the High Street which is closed to traffic and filled with fun fair rides, stalls and music. The event is run by a group of volunteers and some of our Councillors and additional help always welcome either to join the committee or just on the day. Woburn Sands held it's first Music Festival in 2017 in the Recreation Ground, this will now become an annual event held in July. Throughout the afternoon and early evening bands will perform, stalls and refreshments are available. Also annually, the Town Council holds a Garden Competition in July generously sponsored by Frosts Garden Centre and set up as a memorial to Brian Frost. Prizes are awarded for the best hanging basket/tubs display, best front garden and best back gardens. 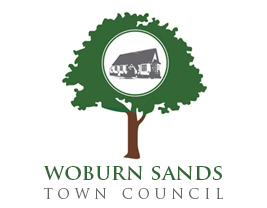 On August Bank Holiday Monday each year, The Woburn Sands Band holds a fayre on Mowbray Green with music and stalls. This is the band's major fundraising event of the year. See links page for more information. Remembrance Sunday is marked by a service at St. Michaels followed by a parade into the town centre led by The Woburn Sands Band for a short Wreath Laying service around the War Memorial starting at 10.45 am. The High Street is closed to traffic to allow plenty of space for residents to gather.